At today’s Samsung press event, the company announced that this month Verizon will receive the Galaxy Note 10.1 complete with 4G LTE connectivity and Jelly Bean. The Note 10.1 isn’t anything new, but for anyone who does pick this new variant up, you will be able to utilize Samsung’s full premium suite of applications, plus the benefits of 4G LTE. The tablet features a 1280 x 800 10.1″ display, 1.4GHz quad-core processor, Jelly Bean, S-Pen, a 5MP back-facing camera, along with a 1.9MP front-facing shooter. As far as release dates, we only have “this month,” so if you plan on picking one up, we will keep you posted once we have an official date. If you have seen reviews of the device, you might already know it’s not the most highly praised Android tablet at all, but if you’re bought into Sammy’s app eco-system, it isn’t a bad choice. Does this tablet interest you? LAS VEGAS, NV – January 7, 2013 – From the 2013 International Consumer Electronics Show (CES), Samsung Telecommunications America (Samsung Mobile), the No. 1 mobile phone provider in the United States and the No. 1 smartphone provider worldwide1, today announced the Samsung Galaxy Note™ 10.1 will be available on the Verizon Wireless 4G LTE Mobile Broadband network in the coming weeks. The Galaxy Note 10.1 optimizes productivity with multiscreen viewing and advanced S Pen functionality, offers entertainment features at home and on-the-go, and allows for creativity through S Pen-specific applications. The Galaxy Note 10.1 is the ideal tool to be more efficient. The multiscreen feature on the Galaxy Note 10.1 gives users the ability to effortlessly utilize two different applications side-by-side simultaneously for true and easy multitasking. Users can view Web pages or videos, or launch other applications while writing or sketching ideas with the S Pen on the other half of the screen without having to toggle back and forth between apps. Polaris® Office provides robust word processing, spreadsheet and presentation capabilities on the Galaxy Note 10.1, and the S Pen support makes it a snap to mark up and annotate documents. Additionally, the Galaxy Note 10.1 is available with Kno education software available for K-12 and high education students. The e-textbook software allows Galaxy Note 10.1 users to download thousands of interactive textbooks. The Galaxy Note 10.1 is also the perfect living room companion. The Galaxy Note 10.1 features Samsung Smart Remote, which transforms the device into a universal remote control that can control an entire home entertainment system and even recommend programs. With Smart Remote, users can easily discover new TV shows and movies, and change the channel directly from the tablet. AllShare® Play enables users to seamlessly pass content from the Galaxy Note 10.1 to other Samsung devices. AllShare Play automatically notifies the Galaxy Note 10.1 of other devices on the same network that are ready to receive video files (Samsung HDTVs, mobile tablets, laptops and other consumer electronic devices).Users can also remotely access files from devices on other networks. Pop up Play – Galaxy Note 10.1 users can watch side-loaded video content while operating any application in full-screen, background view at the same time, providing a “picture in picture” experience. Group Cast allows users to share and collaborate on documents, presentations or images in real-time with multiple friends or co-workers without loading the file separately. Creativity is taken to a new level with the intuitive S Pen that boasts 1,024 levels of pressure sensitivity. The S Pen is embedded directly into a slot in the Galaxy Note 10.1, which activates a taskbar with quick access to optimized S Pen apps such as S Note™, Adobe® Photoshop® Touch, Polaris Office and Kno. The S Note application on the Galaxy Note 10.1 gives users the ability to combine notes and sketches with other digital content in ready-to-use templates. S Note also features productivity tools such as Shape Match, which converts hand-drawn shapes into perfect versions instantly, and Formula Match, which translates hand-written formulas into type and solves them with the Wolfram Alpha search engine. Preloaded with Adobe Photoshop Touch, Galaxy Note 10.1 users can utilize popular Photoshop Touch features such as layers, selection tools, adjustments and filters to customize and edit images, remove people or objects from a photo, or blend two photos together. Photoshop Touch is integrated with Adobe Creative Cloud that gives users free access to file syncing and sharing features and 2 GB of storage space. User’s files can be synched to the Creative Cloud and opened in Photoshop Touch on the desktop or online for further refinement. The Galaxy Note 10.1 boasts a brilliant touchscreen display, allowing customers to watch movies, view pictures and play games that come to life in high-definition (1280×800). 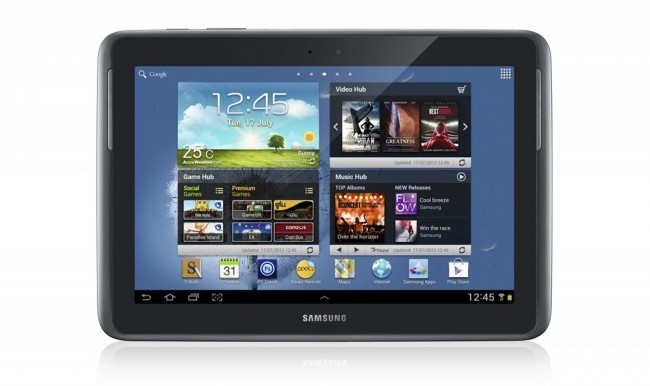 The Galaxy Note 10.1 runs on the Android™ 4.1 operating system and is equipped with a 1.4 GHz quad-core processor that allows users to surf the internet at blazing speeds using the Verizon Wireless 4G LTE network. Measuring just 8.9 millimeters thin (less than half an inch) the Galaxy Note 10.1 weighs only 597 grams (roughly 21 oz. ), making this tablet one of the most portable, premium and stylish tablets available. The device also includes a 5-megapixel main camera and a 1.9-megapixel front-facing camera. The Galaxy Note 10.1 is enterprise-ready and SAFE™ (Samsung for Enterprise) out of the box, meaning that enterprises across multiple industries can fully utilize these phones for business, including emerging Bring Your Own Device (BYOD) programs. Samsung SAFE smartphones and tablets provide stronger security to corporate employees using IT policy management through Microsoft Exchange ActiveSync (EAS), top-tier, multi-vendor Mobile Device Management (MDM) and Virtual Private Network (VPN) support, as well as on device encryption (ODE). In addition, it provides the most extensive Software Development Kit (SDK) to Solution Partners, which allows them to develop differentiated solutions on Samsung devices. This security-oriented SDK support applies to horizontal and various vertical solutions.